Planet Bike sent me their Blaze Dynamo headlamp to test. The light is designed to work with all the modern 6 volt dyno hubs. It comes with a standlight feature so it stays on for a few minutes when you stop for a red light or park and still need a little light to lock up. It also has another very unusual feature for a generator light, a super-flash mode for when being seen is more important than seeing where you are going. I hope other manufacturers begin to add flashing modes, these are a great benefit when riding in urban rush-hour conditions. I powered the Blaze Dynamo with the Schmidt hub on my Schwinn Dutch conversion. This allowed me to compare it to the Busch & Müller DLumotec. Both are 1 watt LED lights. 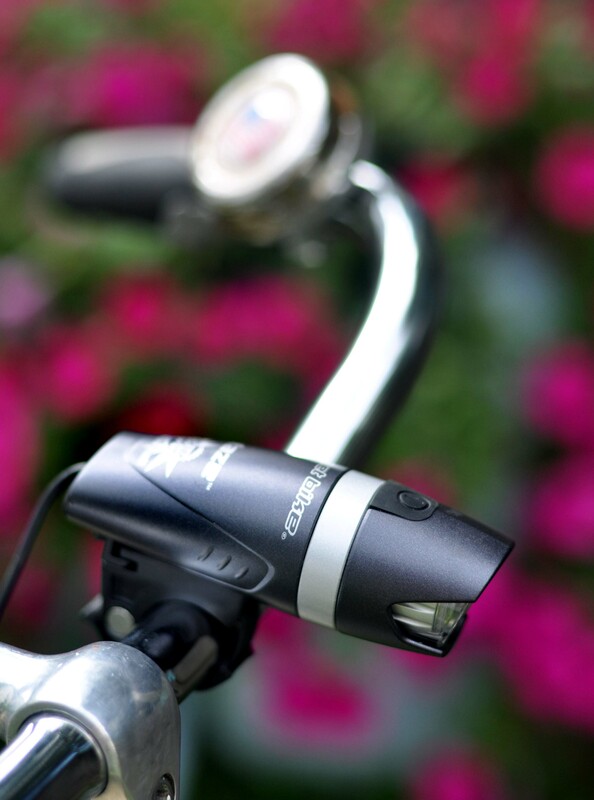 The Planet Bike Blaze LED is mounted in the same basic lamp body as their regular battery operated Blaze. 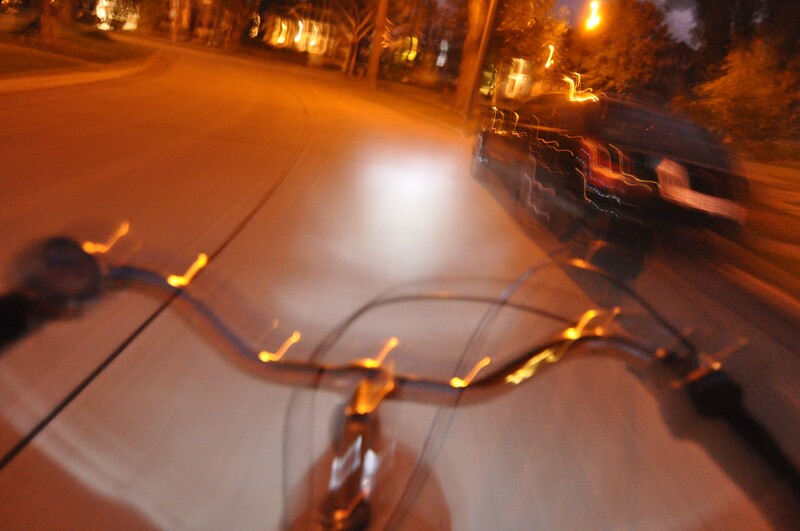 Planet Bike Blaze lights are my go-to battery lights because they are made by Planet Bike and I like that they donate 25% of their profits to bicycle advocacy organizations. But I also use them because they work really well and are easy to swap from bike to bike. The Blaze Dynamo light uses the same well made clamp that the other Planet bike battery operated lights use. I like these clamps quite a bit. The set up was super simple. The light came with red and black wires, pre-stripped and ready for a connector. It took me all of five minutes to install the light on my bike. The only down side to this set-up is that while the light has a nice quick release, the wire connectors are behind the dropout on the front fork. No big deal to install, but not what I would call “quick” if you want to pull your light off when you park it since you will more than likely want to zip-tie the lead wire to the fork leg and because the connectors would be difficult to hook up in the dark. As you can see, the blaze beam is very bright and tightly focused. You can direct in pretty far down the street and light up quite a bit of pavement for fast riding. The Blaze is blazingly bright for a $69 light. I had it pointed a little closer than it needs to be so it would be in the same spot as the DLumotec I normally run on this bike. This way the beam patterns are more directly comparable in the photographs. You can see there is a small amount of spill to light near the bike, but not as much as the DLumotec below. You can also see the beam of the Blaze is much brighter than the beam of the Lumotec. This makes the Blaze a better choice for faster riding because it lights up the road further away from the bike. It might also be a better choice if you live in an urban area, since streetlights provide enough light to see pot holes or glass closer to your bike. You can see the beam pattern of the DLumotec is broader. The focused spot is not nearly as bright as the Blaze, but there is more light spilling near the bike. But the feature on the Blaze that makes it stand out from other lights is the superflash mode. This feature is a rapid flash mode that is bright enough to be seen in daylight. I am not aware of any other dynamo powered headlights that have this feature. If most of your riding is in an urban area with heavy traffic and inattentive drivers, I think this is the light for you. The only thing I would suggest is you add a quick release connector to the lead wire close to the headlight to make it easier to remove if you lock your bike up unattended and are worried about someone stealing the light. 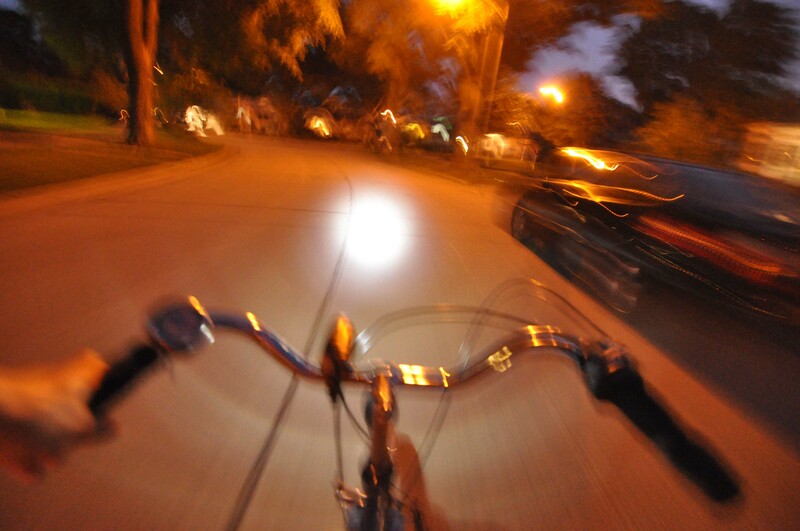 The brightly focused light with a long throw makes the Planet Bike Blaze a good choice for doing faster paced training rides on well maintained rural or suburban roads or paved trails. I don’t think this light has enough spill to use off-road. For off-road riding, it would make a great secondary light if combined with something with a wider beam pattern, like the DLumotec. Overall I think this is a great light at a great price point. The superflash mode sets a new mark for other manufacturers to meet for dynamo-powered lights. Just add a quick release connector to the lead wire so you can keep your investment. Thanks for the review! I currently use the regular Planet Bike Blaze but have been thinking about getting the generator model.